With a nod to Bob Cassidy's original White Dwarf and his later White Dwarf Revisited Scott's Single White Dwarf peek envelope, does away with the second envelope, closes the window and instead uses a standard, security lined, single, white letter envelope which can be freely handled by the spectator and is suitable for stage, cabaret and close up. This 45-minute instant download video includes full manufacturing instructions (it shouldn't take more than 15 mins and cost pennies to make one), a number of routines, including, 'Dwarf Dimensional Telepathy', 'Name and Place' and Scott's own 'A Psychic Medium Called? ', plus various handling idea's and performance tips. 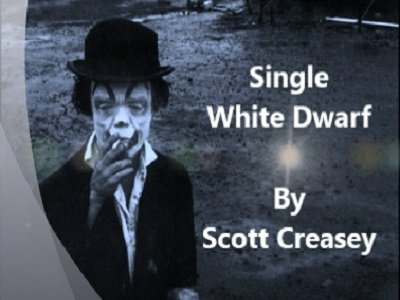 Scott Creasey outdoes himself with the latest of his DIY gimmicked-envelope videos. If you have any of Scott's other ebooks and videos from lybrary, you already know that he (1) really knows his stuff; (2) has brilliantly creative ideas for gimmicked envelopes; and (3) produces excellent instructional videos with good production values. Expanding upon and refining a Bob Cassidy envelope concept, he shows you how to make--in about five minutes--a peek envelope. We're not talking window envelope, Shaxon envelope, or one using a tricky impression gimmick. It's a single opaque mailing envelope, plain and simple. And it's exceedingly clean and clever. In addition to the construction instructions--easy enough for a pre-schooler with round-nosed scissors and a glue stick to follow--he gives you three routines. Two are classic Cassidy routines--Name and Place and 4th Dimensional Telepathy--that once you see how the envelope works, you'll wonder why you've been doing the original versions with all the "moves" and "subtleties" all these years. Switch to the Single White Dwarf envelope, and you don't have to do much of anything to accomplish these mental miracles. The third is Scott's own routine which makes the spectator the psychic. If you build up the patter as he does, it's a cute and mysterious routine I like it. Now truth be told, I know of an even lazier version of a Single White Dwarf envelope that takes no construction whatsoever, but let's just say it's a little touchy and not as clean. Scott's envelope, while ever-so-slightly more complicated, is better. Once you see how it works, you'll go, "Of course it logically works that way. Why didn't I come up with that? That's terrific!" This is highly recommended because you are going to want a few of these in your mentalism bag at all times. They are worth their weight in gold.